The Corsair II was designed as a lightweight attack aircraft to supplement and later replace the Douglas A-4 Skyhawk. In addition to service in our Navy, Corsair II's were flown by our Air Force, Air National Guard, and several other nations. The Ling· Temco-Vought A-7 production line started on 19 March 1964 and continued until September 1984; 1,545 were built. Its first flight, powered by a Pratt & Whitney TF3O-P-6 turbofan engine, was on 27 September 1965. Navy Preliminary Evaluations were underway in January 1966. Test programs were accomplished with wartime urgency, and the first fleet delivery (VA-174) was on 14 October 1966. 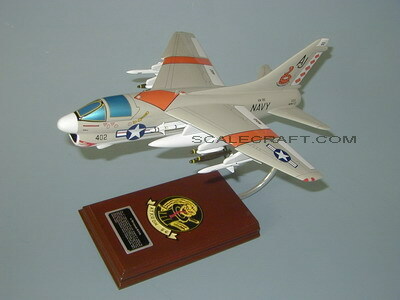 Retirement of the last two Navy A-7 aircraft fleet operational squadrons (VA-46 and VA-72) was in May 1991. Mahogany Wood. Scale: 1/40. Wingspan 11 1/2 inches, Length 13 7/8 inches.